Pattypan squash, also known as scallop squash, is a variety of summer squashes originated from Mexico. Scallop squash generally picked up while they are young, immature, and tender, at a stage, they are sweeter and more appetizing. Native Americans have long been aware of scallop squash cultivation since centuries. Botanically, they belong to the Cucurbitaceae or gourd family of vegetables and closely related to other summer squash varieties such as zucchini, crookneck squash, cocozelle, etc. Scientific name: C. pepo var. clypeata. Pattypan squash. Note for golden yellow blossom. Photo:vasenka. Pattypan squash is a rapidly growing half-shrubby plant. It prefers organic, well-drained, sandy soils for best growth. After about 35-45 days of the plantation, yellow flowers appears which soon develop into attractive, flattened, disc-like fruit pods with scallop shell like undulating edges. White scallop squash. Photo courtesy: twisted-string. Pattypan squash comes in white, yellow and deep green colors. Usually, young, tender fruits picked in their early stages for best quality and preferred in cooking. If left to grow, pattypan squash soon enlarges in size, its outer peel becomes tougher, and seeds turn harder and inedible. Use protective gloves and knife while harvesting to avoid contact with prickly stem and leaves. 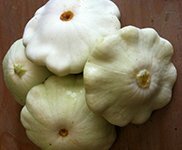 Apart from its fruits, summer squash flowers including pattypan flowers are one of the most sought after items and can make a great side-dish. Male blossoms generally picked up, and female flowers left for growing into fruits. Small numbers of female flowers with intact, very tiny fruit (baby scallop squash) can also be sold in the markets and indeed, command a special price. Just like other summer variety squash types, scallop squash too is one of the very low-calorie vegetables. 100 grams of raw fruit carry just 18 calories. It contains no saturated fats or cholesterol. Its peel is a good source of dietary fiber. Fresh pattypan fruits carry relatively more vitamin A than zucchini; provide about 217 IU per 100 g.
Golden-yellow skin scallopini is good source of flavonoid poly-phenolic antioxidants such as carotenes, lutein, and zeaxanthin. These compounds help scavenge harmful oxygen-derived free radicals and reactive oxygen species (ROS) from the body that play a role in aging and various disease processes. 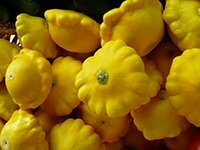 pattypan squash holds relatively more amounts of folates, pyridoxine, niacin than zucchini. It provides 30 µg or 7.5% of RDA per 100 gm. Folate is a necessary element for cell division and DNA synthesis. When taken adequately during early pregnancy, it may help prevent neural tube defects in the fetus. It has less sodium (1 mg/100 g) and moderate levels of potassium (187 mg/100 g), an important intra-cellular electrolyte. Potassium is a heart friendly electrolyte and helps bring the reduction in blood pressure and heart rates by countering pressing effects of sodium. Fresh scallop squash indeed is an excellent source of vitamin-C. It provides about 18 µg or 30% of daily required levels per 100 g. Vitamin-C is a water-soluble, natural antioxidant. Further, pattypan squash carry modest levels of other B-complex groups of vitamins like thiamin, pyridoxine, riboflavin, and minerals like calcium, iron, manganese, phosphorus, and zinc. Scallop summer squash (C. pepo var. clypeata), raw with skin, Nutrition value per 100 g.
Scallopini squash in a market. Photo courtesy: notionscapital. Summer squash including pattypan begins arriving in the markets from May until the end of September. In the markets buy fresh, small to medium, bright, young fruits. Avoid very large, hard-skinned, overmature ones as they tend to be unappetizing. Also avoid those with cuts, spots, bruised, etc. At home, store fresh squash as you do for other summer squash like zucchini, inside a plastic bag and place inside the vegetable compartment in the refrigerator, set at appropriate relative humidity. They can be stored fresh for up to 2-3 days. Pattypan squash used in a variety of recipes like stuffed, grilled, roasted, etc. At home, wash fruits in cold water to remove any surface sand. Trim the stem end. Tender pattypan can be used with intact skin. Cut the fruit into small cubes/wedges as you may desire to use them in cooking. 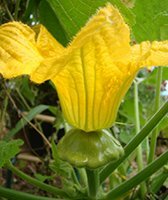 As in zucchini blossoms, scallopini flowers also edible delicacies. In general, male blossoms picked up; allowing female flowers to continue to grow into fruits. To prepare, open up flowers and carefully inspect for insects. Pull off any calyces attached firmly at the base. Tender scallopini slices can be added to salads. Pattypan squash blossoms dipped in batter and fried in oil and enjoyed as delicious fritters. As in pumpkin, pattypan can be employed in pies, cakes, custards, etc. Its whole fruit can be stuffed with peas, corn, cheese, mushrooms, and herbs and baked. Pattypan squash rarely causes any allergic reactions. (Medical disclaimer). <<-You may also like to read Acorn squash nutrition facts. <<-Also read Spaghetti squash nutrition facts. <<-Also, Crookneck squash nutrition facts. <<-Back to Vegetables from Pattypan Squash. Visit here for an impressive list of vegetables with complete illustrations of their nutrition facts and health benefits. University of california cooperative extension (PDF).